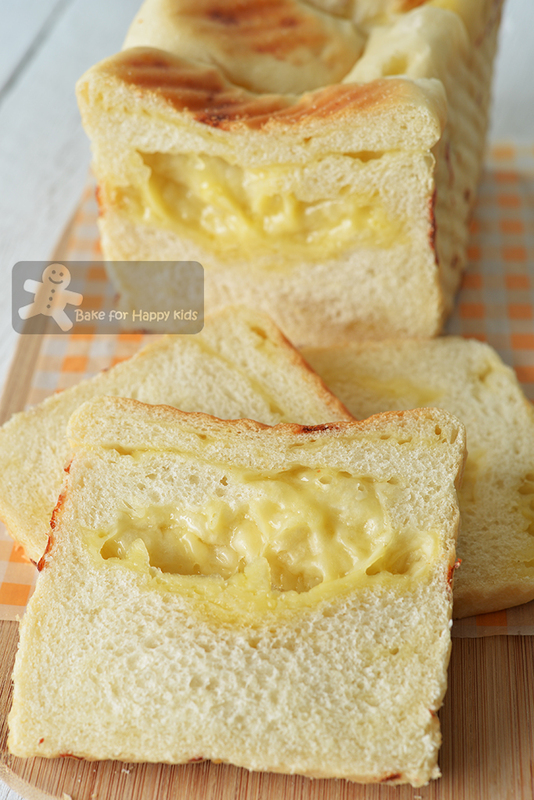 My son and I love cheesy breads and we can't stop thinking of the Cheesy Earthquake Bread that I have baked earlier at here. It is REAL cheesy, moist, soft and delicious! I can bake the same cheesy bread again and again but but but... I'm ambitious! I want to bake another cheesy bread that is taller, fluffier, softer and cheesier. Is it possible? Is this bread more like the BreadTalk Soft White Cheese Earthquake Bread? YES that this bread is taller, fluffier and cheesier! So cheesy that some slices of the bread look like they have been erupted with flowing cheese!!! YUM!!! Based on the idea on how I discovered The Fluffiest White Bread in the World at Saveur, I did the same by searching "soft white bread recipe" via Google and saw a highly rated bread recipe at Food.com with no eggs, no milk and no butter. Hey! I know this recipe!!! It is the Extremely Soft Vegan Sandwich Bread that I have baked at here! Hmmm... I shall incorporate this recipe to bake my next Cheesy Earthquake Bread. Incorporating a massive amount of cheese inside any soft bread dough with less rigid structure will retard the rising of the bread. To maximise the rising step, the loaf has to be shaped with three portions of dough instead of shaping all into just one long log like the one that I baked at here so that the three dough can support each other and push each other upwards. How do I know? I have actually used the one-log shaping method to bake another loaf with more bread dough before and it didn't rise any much taller. So clearly, this one-long-log shaping method is NOT the method to use if you want to bake a tall well risen bread but it is the method to use if you are after a pretty cheesy swirl in your cheesy bread. More yeast means more rising power and this is why I have increased the amount of yeast used from 1 tsp to 1 1/2 tsp. You can use up to 2 tsp if you like but I prefer to use as less yeast as possible. A erupting cheesy earthquake bread must have a lot of cheese but please bear in mind that too much will make the bread sink when it is completely cooled and this happened a lot to my bread too. And so I reckon that the cut-off amount to add is 200g cheese for every 330g bread flour and I don't think I can add more cheese any further!!! If I want a perfect square cheesy bread, I know that I can't use this soft bread recipe to bake these cheesy overloaded bread because I will need a strong rigid bread structure to push the bread upwards to form a perfect square and stay firm and square so that the bread with the molten cheese filling won't sink much after cooling. Soft or square? I would say soft is for me! 5) We love Jarlsberg cheese! 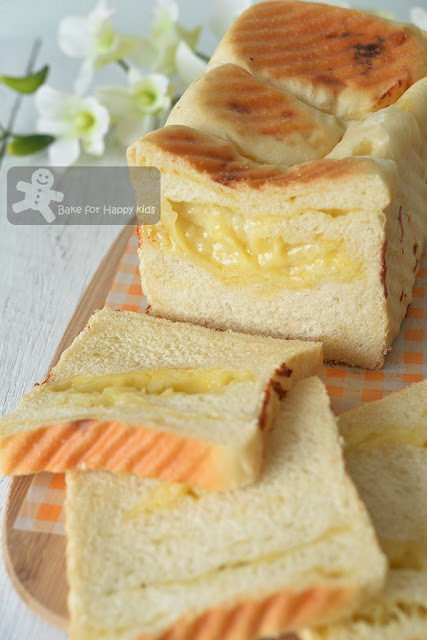 I have tried baking several cheesy breads with different cheeses including the flavoursome Swiss Gruyère and I must say Jarlsberg is the best for baking cheesy bread!!! It is semi-soft creamy and stretchy!!! To us, these breads with Jarlsberg cheese are the most ultimate cheesy! You think? For those who don't know Jarlsberg, it is a mild cow's-milk cheese with large regular holes. And if can't find Jarlsberg cheese in the place that you live, no worries! You can use any kind of semi-hard or hard cheese as long as you like it. So, this is my taller, fluffier and cheesier Soft White Cheese Earthquake Bread and I named this recipe, MORE Like BreadTalk Soft White Cheesy Earthquake Bread Recipe Two. Recipe One at here or Two? To be fair, I must say that both are equally good and soft. The bread from Recipe One is moister with rich buttery taste. This bread from Recipe Two is lighter and fluffier and can amazingly hold a lot more cheese, in fact double the amount than One. So you like one or two? I named this recipe... MORE Like BreadTalk Soft White Cheesy Earthquake Bread Recipe Two. ... because it is taller and more squarish. Will the money-making BreadTalk bakeries use any exquisite cheese to bake their cheesy breads? Not sure but ours is made with extra creamy yummy Jarlsberg! Ultimate soft and cheesy. What can I say? Here's a video showing how I baked this super yummy cheesy bread. I did it again!!! I have completed my 6th marathon and my timing is 03:50:47. Very happy with my run. Yay! 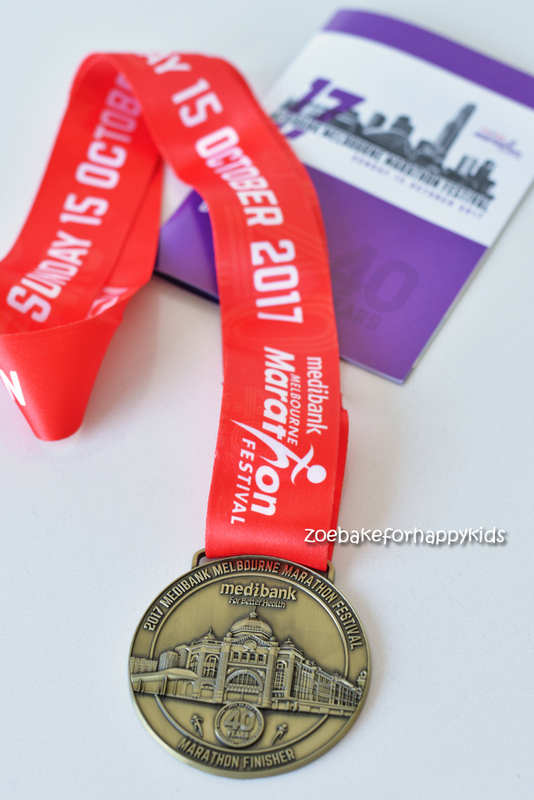 I have completed my 6th marathon! Here's my MORE Like BreadTalk Soft White Cheese Earthquake Bread recipe Two incorporated with the extremely soft white bread recipe from here. 200g grated cheese or any hard or semi-soft cheeses that you like - I'm using Jarlsberg. Place all the bread dough ingredients in a breadmaker according to the order of the above list. Use the dough setting to knead the dough until it is smooth and elastic and allow the dough to prove for 1 hr or until doubled in size. If breadmaker is not available, you can use an electric mixer with a dough hook to knead the dough. Using an electric mixer with low mixing speed, mix all dough ingredients to form a dough first. Then, keep kneading the dough for about 25-30 mins or until the dough is smooth and elastic. Dough is elastic enough if it passes the window panel stretch. Transfer dough into a large bowl and cover it with a cling wrap. Allow the dough to rise in a warm and humid place for about 1 hr or until doubled in size. Grease pullman pan and its lid. To shape, transfer dough onto a lightly-floured (optional) non-stick surface. Divide into 3 portions and use your hand to shape each portion of dough into a smooth round dough. Using a lightly floured (optional) rolling pin, roll each portion of dough into a long and flat oval shape (about 20 cm). Distribute about 20g of grated cheese evenly onto the dough, leaving a narrow border at the edges. Use your fingers to pick one shorter side of the dough and tuck and roll the dough like a Swiss roll. Use the rolling pin to flatten and roll the dough into a long rod shape again. Distribute about 45g of grated cheese evenly onto the dough again. Then, pick one shorter side of the dough and roll it like a Swiss roll again. Repeat this rolling step with the remaining two portions of dough. Place the shaped dough with their seams side down into the greased pan. Press the top of the dough lightly to form an even surface. Allow the loaves to prove for another 1 hr or until the dough is going to reach the maximum height of the loaf pans. Cover the loaf pan with its lid. Bake in preheated oven at 180°C for 25 mins or until thoroughly baked. Note: If you don't have a lid for your loaf pan, you can bake the bread without covering it. If the top of your bread turns brown too quickly after baking for 15-20 mins, cover the bread very loosely with foil and continue to bake until the bread is thoroughly baked. When the bread is removed from the oven, remove the lid and unmould the bread immediately. Transfer bread on a wire rack to cool it completely. Due to the massive amount of the cheesy filling, this extremely soft bread will shrink and sink slightly. Slice and serve. Best to consume within the same day of bake. Or keep the bread in an airtight container at room temperature for up to 3 days. Congratulations Zoe ! You're a super mom. Love the bread too. Cheese in bread or on bread is always a winner! I would love to try making a cheese tart or stuffed roll! Your loaf looks gorgeous! 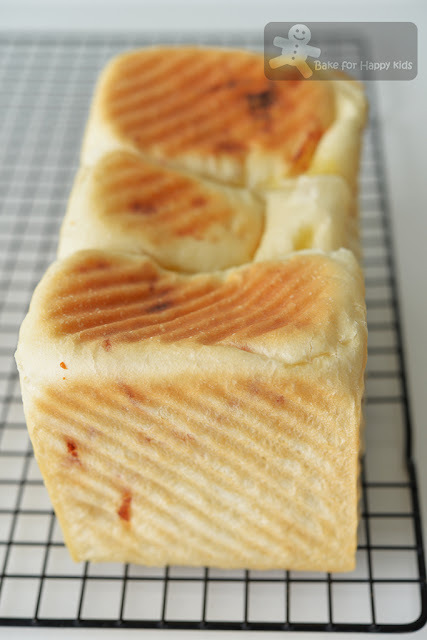 Hi, I am confuse on the notes for shaping steps, should we be using one dough shaping method for this cheese bread? Hi Wendy, yes you can but your loaf won't rise very tall. If not sure, please read my above well-described baking tips especially point one about the shaping step. Cheers! Hi Zoe, can i use mozarella instead of the type of cheese you mentioned? Nice recipe you have there and i am tempted to bake this bread soon. Thank you! 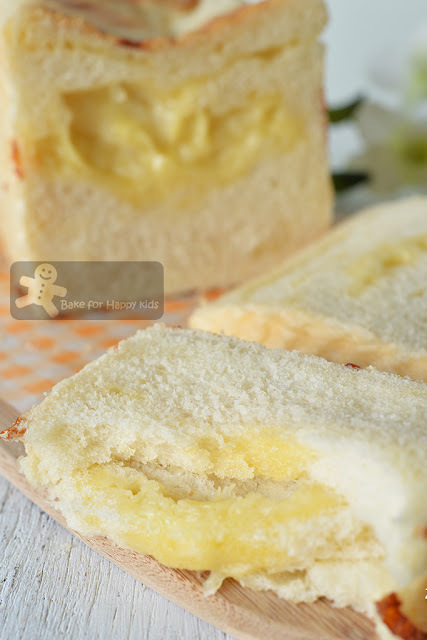 Hi Mariana, you can use any grated cheese that you like to bake this bread. Happy Baking!